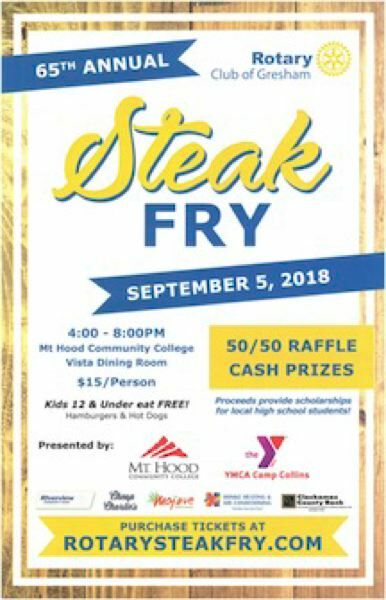 The Gresham Rotary Club's annual fundraising Steak Fry is planned for 4-8 p.m. Wednesday, Sept. 5, at the Vista Dining Room at Mt. Hood Community College. The Rotary Club of Gresham is gearing up for its annual Steak Fry, and purchasing tickets has never been easier. This year, the club has launched a website where people can purchase their Steak Fry and raffle tickets. The. customer will have the option of having their tickets mailed, picked up during the Rotary's weekly meeting at the M&M Lounge at 137 N Main Ave., or having tickets delivered. Tickets cost $15 each. The event is from 4-8 p.m. Wednesday, Sept. 5, at the Vista Dining Room on the Mt. Hood Community College campus, 26000 S.E. Stark St., Gresham. This year's grand prize raffle item is a four-burner propane grill with a value of $700. Raffle tickets can be purchased at the same website for $10 per entry. The Gresham Rotary holds several fundraising events each year, but the Steak Fry is by far its largest. The club provides ongoing support to the Gresham Japanese Garden at Main City Park, as well as tree-planting efforts elsewhere in Gresham. The club also provides about $20,000 a year in college scholarships for local graduating high school seniors who plan to attend Mt. Hood Community College. The club also provides yearly financial support to local nonprofit organizations.